Today is the last day for 40% off everything at LOFT. Use code FALLFEST. 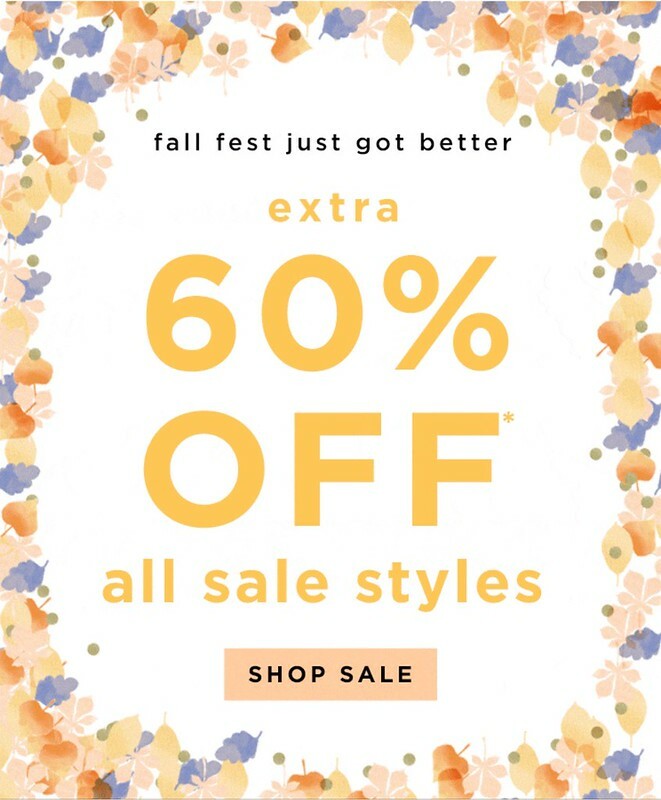 You can also get an extra 60% off sale styles. 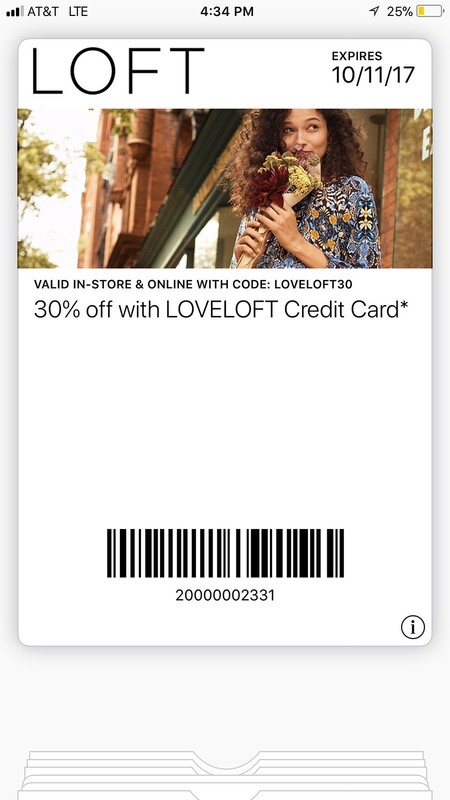 Since no code is needed for the sale markdowns cardmembers can use code LOVELOFT30 for an extra 30% off*. For example, these cargo pants (last seen here) are a steal at $10 (or $7 for cardmembers with the extra 30% off code) after discounts. I took them in size 2P which has a 28.5″ waist and a 26.5″ inseam and for size reference I’m 5′ 2.5″. *Note: You may not see the extra 30% off reflected until you enter your credit card’s security code when reviewing your order and before you click on the ‘place order’ button. Refer to the below example. When shopping in store on Friday my local LOFT manually adjusted the price on the items I ordered via the iPad to include: (1) the LOFT Cares card (Ann Cares cards are also available at Ann Taylor) for extra 20% off for non-cardmembers or an extra 25% off for cardmembers and (2) the extra 10% off full-price tops (applicable the entire month of October for cardmembers). These two cardmember savings were stacked on top of the current 40% off full-price promotion! On Saturday I was able to use the above LOVELOFT30 cardmember offer in store on top of the extra 60% off sale markdowns. coupons which for some reason always seem to be a surprise. 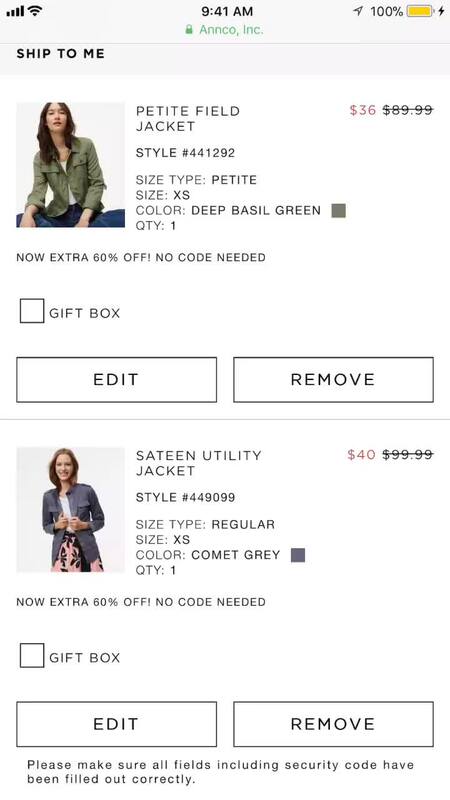 If you’re a LOFT or Ann Taylor cardmember text LOVELOFT30 to 28162 to save this offer to your mobile wallet as shown below. Take advantage of this cardmember offer in store or online since this offer expires on 10/11. Special thanks to Irene and Jen for sharing the code as mentioned on this page of my blog. I tried to share this code as much as possible via my Instagram stories and I used it all month long as soon as I found out– it’s saved me so much money! Refer to the front and back of the physical coupon mailer as shared by Jen. Also if any of you have missed this code up until now please let me know! I don’t keep a mailing list for newsletters but I do have emails for those of you that subscribe to my blog via email. Rest assured I don’t do anything with your information as I feel it’s invasive. I welcome any suggestions for the best way to keep in touch. I tried on a lot of items recently and as a workaround I quickly shared a few of them on my YouTube channel. Please subscribe to my channel as a way to let me know if you would like to see more of these quick updates between blog posts. I know that my readers trust my reviews and reference current and previous reviews during sales so I try my best to focus on quality posts. I reserve quick daily updates for my Instagram stories and the sale alerts page. 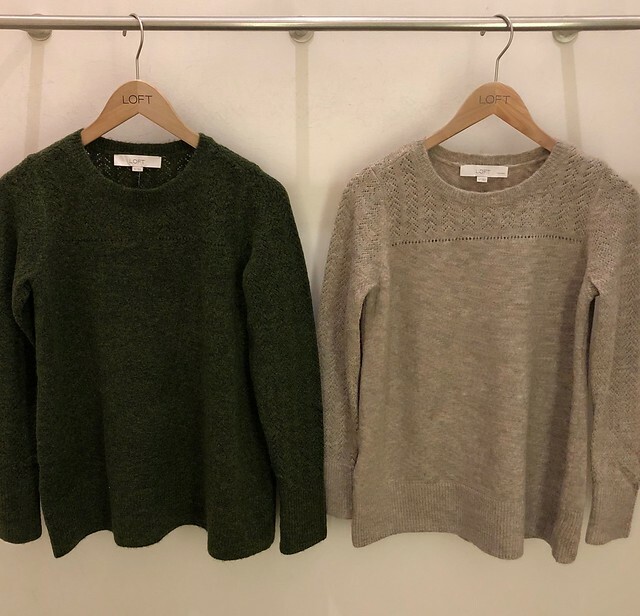 This sweater was at the top of my wishlist due to the pretty pointelle detail which is more visible in the taupe color than the olive color below. It’s a longer overall length so I love that it covers the front and backside which I prefer. I took size SP for a loose and comfortable fit but I wish I tried on size XSP for comparison. Nevertheless I would say this sweater runs true to size for a relaxed fit. 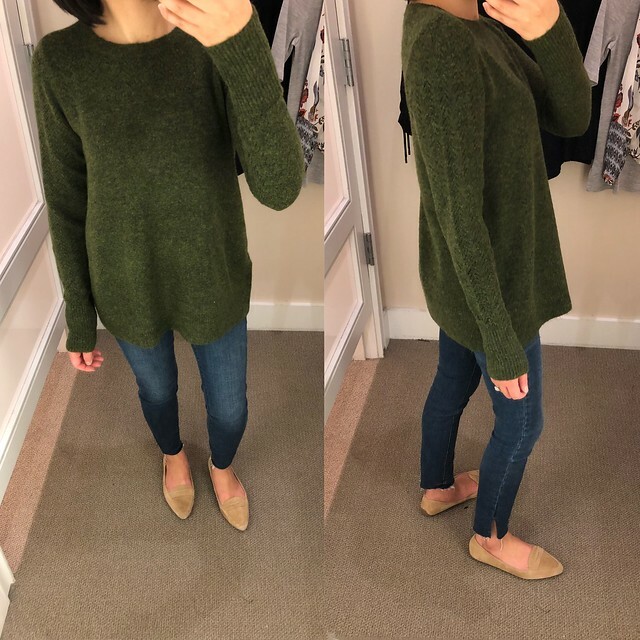 I also tried on size XS regular below in the olive color which looks like Christmas tree green. There are flecks of yellow in the material so the close up pictures kept making the material look like a putrid green. The below picture should be a close representation of the color in person. The sweater is not itchy since it doesn’t contain any wool. Update 10/12/18: This sweater is back for 2018 here. 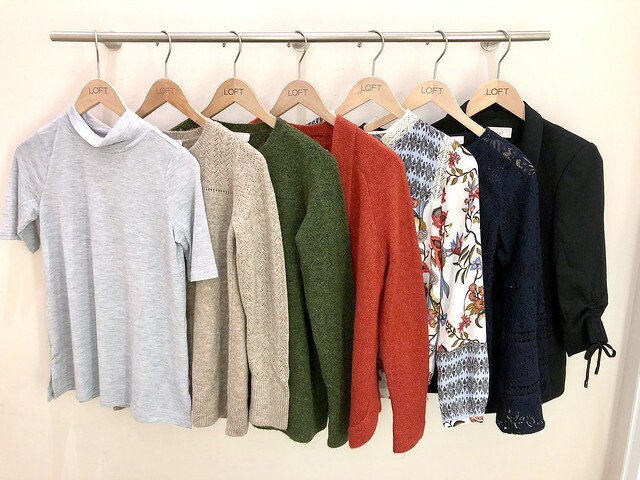 Size XS regular is the equivalent of size SP but you’ll notice that while the sweaters are similar in overall length the sleeves are much longer in the regular missy sizes. 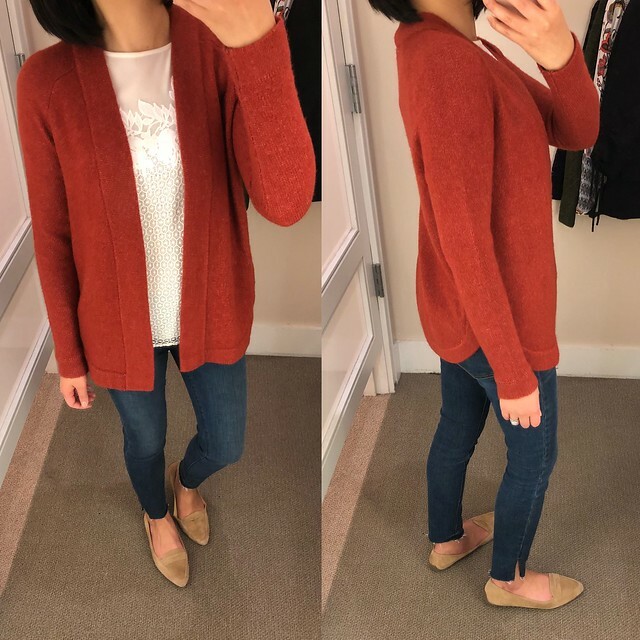 I’m late to trying on this soft and cozy cardigan but I loved it so much I also ordered the neutral biscuit heather color as seen on Annie @stylishpetite and Tracey @mysecretlookbook feeds. This cardigan fits about once size bigger since size XXSP fits like size XSP. I found the sleeves run longer but that’s easily remedied by pushing them up for a scrunched look. 10/14 Correction: The cardigan contains 28% merino wool but I didn’t find it to be scratchy. 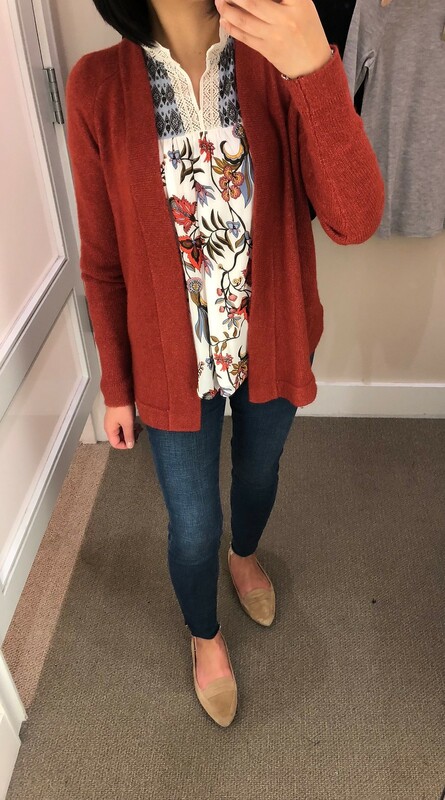 This blouse is not something I would normally gravitate towards due to the bold print but I really love how it looks with paired with the clay fire color cardigan. 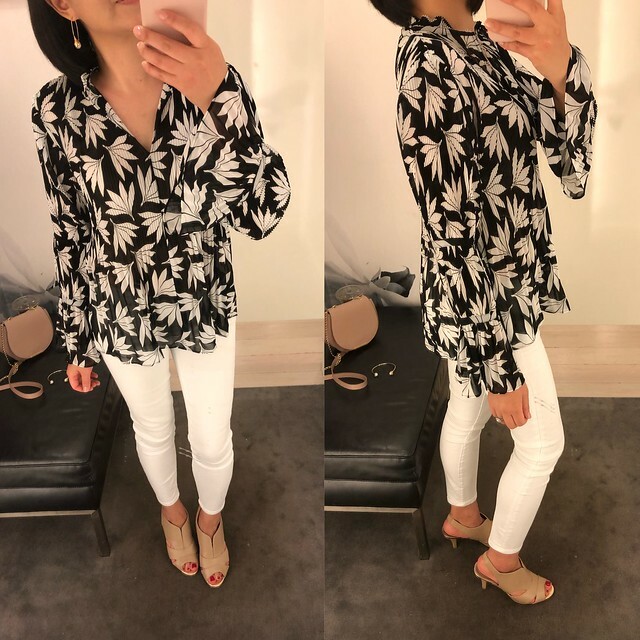 I was trying on size XSP and I noticed how difficult it was to even take the blouse of of the hanger because the v-neck is cut very high. There is also no keyhole opening the back for easier on and off. I got the blouse on easily enough but I panicked quite a bit when taking it off since I was so afraid I would get makeup all over the collar. I ordered size XXS regular to try in the hopes that the v-neck is low enough to slip over my head more easily. Aside from the higher v-neck this top runs true to size. 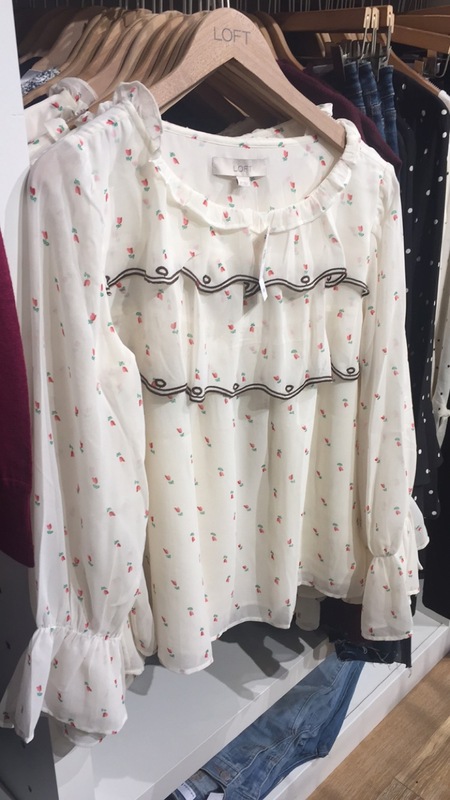 Update 10/13: There was an error with my in-store purchase last weekend and I received the blouse in size XXSP. I used a seam ripper to free the v-neck and now it’s much easier to put on and take it off. 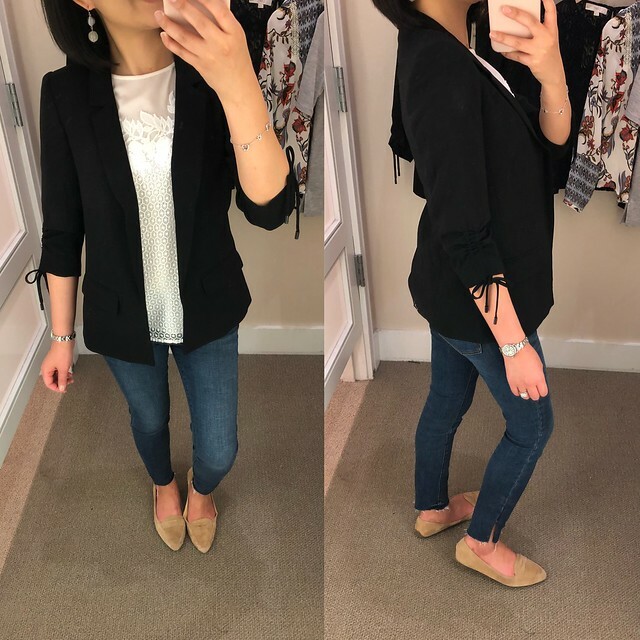 I love the machine washable material they used for this blazer since it drapes well and it’s thin enough to wear comfortably under a jacket without feeling stuffy. This spring and summer favorite blazer is now available in a chic black. It’s currently only available in regular missy sizes in black but hopefully the petite sizes will soon appear online. I found that it fits true to size. 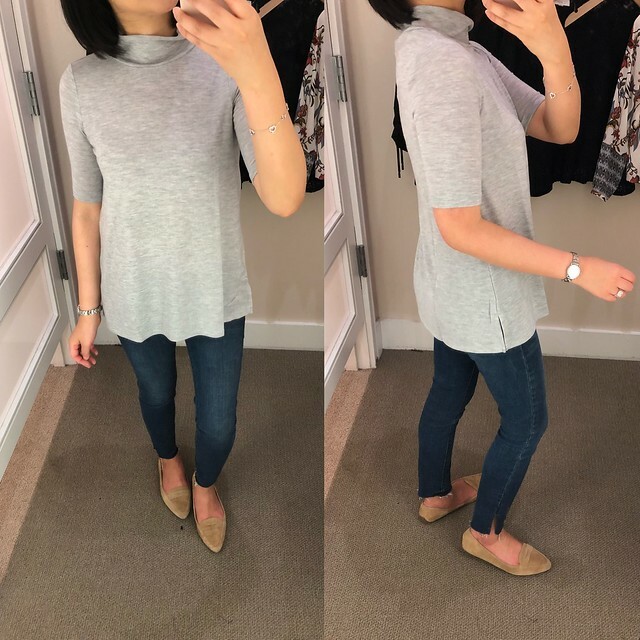 This swing tee was also on my wishlist and I was happy to find it in store to try on. It fits true to size in my usual size XSP for a relaxed but flattering fit. It’s a thin t-shirt material so it won’t offer any warmth but it will layer easily under cardigans. I would be careful about doing a half tuck with it because it can be prone to getting those mysterious little holes near your belly button due to the thin fabric. Su was interested in this new lace top so I tried it on for size and found that it runs true to size. The lace is not scratchy, it’s very beautiful and well made and the sleeves are not too long in petites. 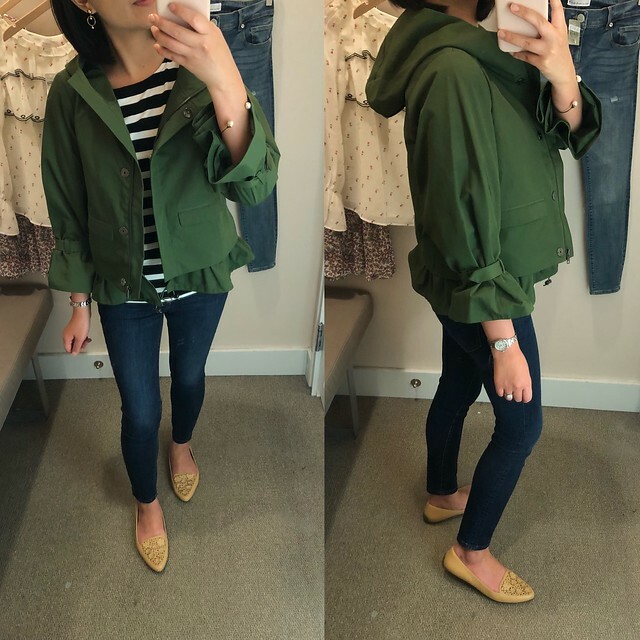 I also visited LOFT @styleof_thehill this past weekend (they have the best sale finds and I always get lucky since ladies my size return to this store) and I came across this adorable raincoat. It fits true to size and the hood is a really great size. The sleeves and collar are so flattering but the coat may hit at an odd length if you have a longer torso. I passed on this lovely jacket since I didn’t think I would reach for it enough plus our coat closet is already bursting. This jacket currently 60% off and if you’re a cardmember you can use LOVELOFT30 for an extra 30% off making it only $38 after discounts! *Note: You may not see the extra 30% off reflected until you enter your credit card’s security code when reviewing your order and before you click on the ‘place order’ button. 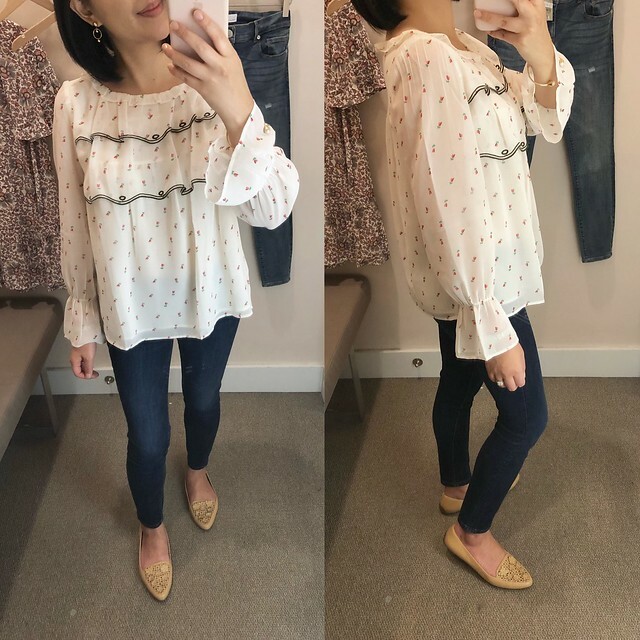 I also found this adorable rosebud blouse as seen on Nicole @nhowel1 (hover over the first image and then click right to see the top in her third slide) in the sale section. Size XXS regular fits me loose and wide but I love how cute this blouse is with the little flowers and feminine ruffles. It fits wide and boxy so I would recommend sizing down for the best fit. This top only comes in regular missy sizes and I took home my usual size XXS regular. 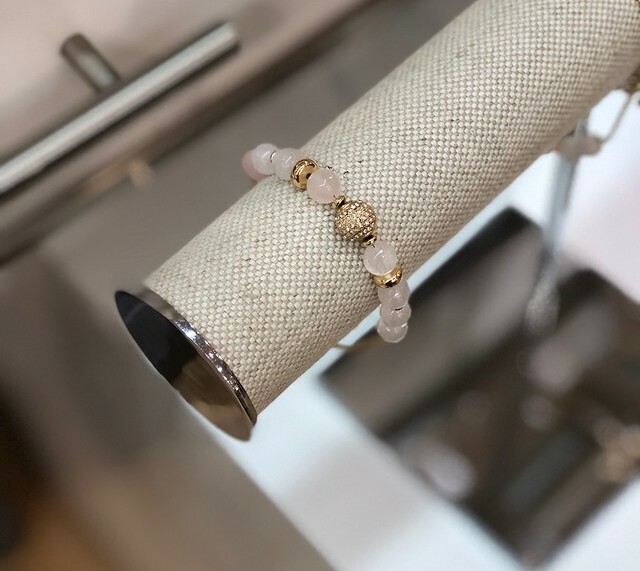 I love this pretty adjustable bracelet but it’s currently only 40% off. I’m keeping an eye out for a better sale to snag it. 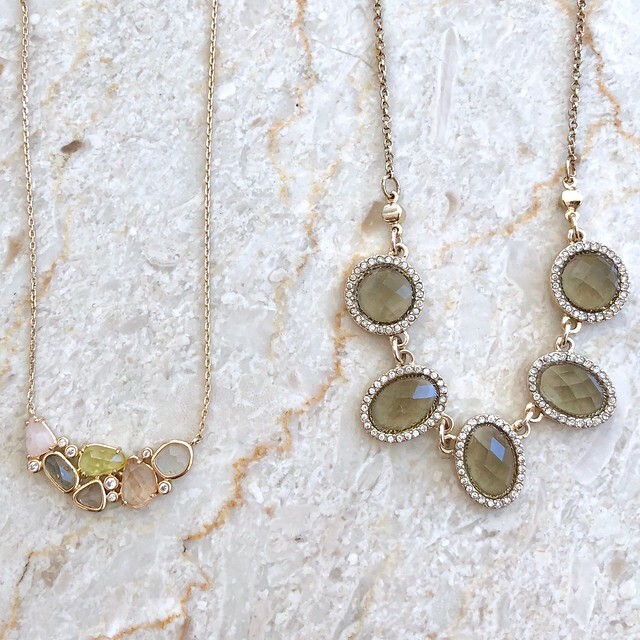 I recently picked up these two new necklaces at LOFT and Ann Taylor. I love the pretty stones and the delicate details. Both of them are adjustable length making it easy to accommodate various necklines. 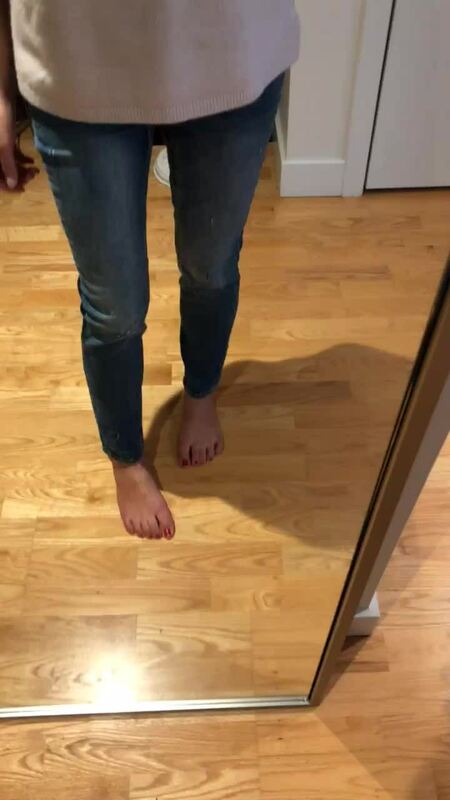 I ordered these new distressed skinny jeans last week since May recommended them and I found that they fit true to size. They are more high waisted but still comfortable with a straight fit through the legs. 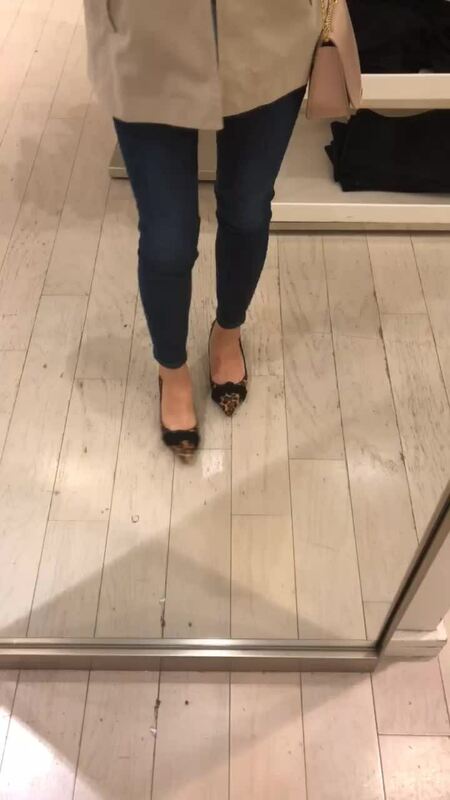 I also miraculously found these highly coveted sold out jeans in store and in my size and if I had to chose then I prefer this latter pair more due to the tapered legs (see them on me here). 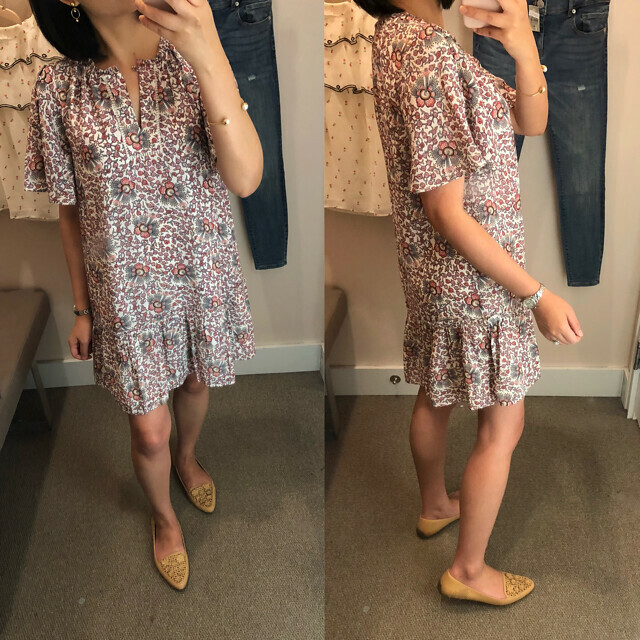 This pretty floral print dress on super sale in the sale section but I wasn’t sure how much I’d wear it now so I passed on it even though it’s currently only $29.95 (or $20.97 for cardmembers with code LOVELOFT30) after discounts. 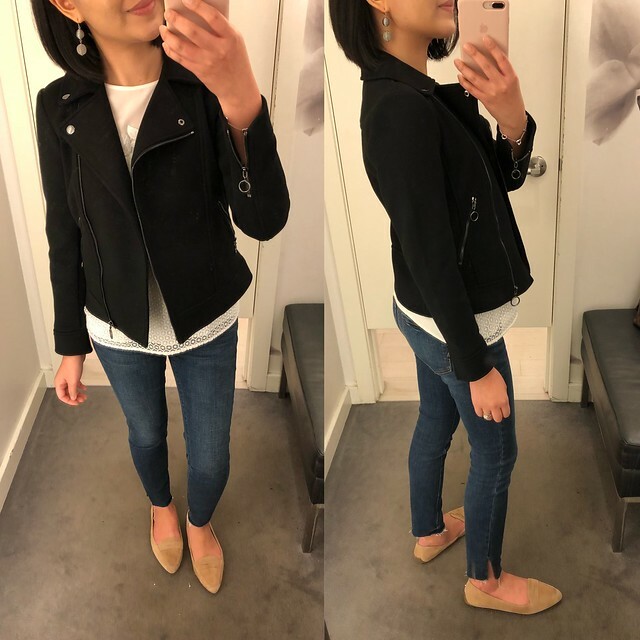 I tried on size XSP which is a decent length on me compared size XXSP (review here) which was too short for my preference. This dress has a swingy fit and it runs wide/big so I would suggest sizing down for the best fit. LOFT posted these stirrups on their feed two weeks ago and these pants generated a lot of negative reaction from everyone. I am skeptical about stirrups but they would tuck into tall boots neatly so they do serve a purpose. These run very tight in the calves so if you have larger calves then you may want to size up so you won’t get your circulation cut off while wearing them. They’re so snug they feel like you’re wearing Spanx since you have to peel them off. I’d say they run true to size/one size smaller depending on how snug you prefer to wear your leggings. 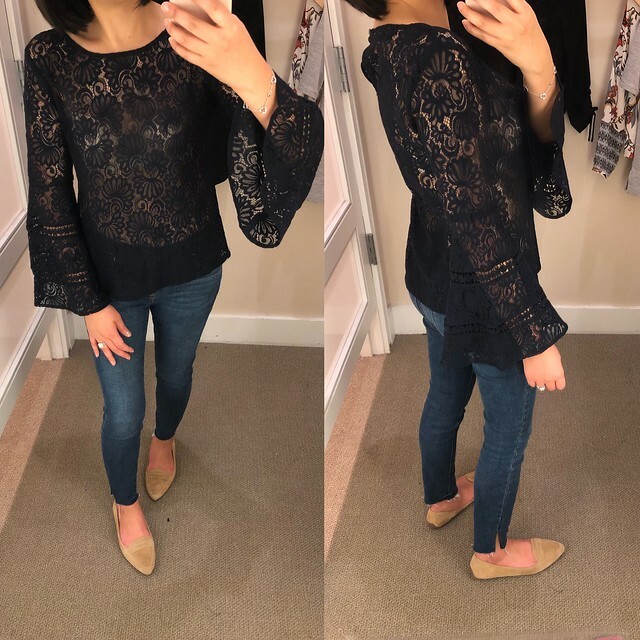 If you remember this lacy bell sleeve blouse from past season then you’ll want to head to your local LOFT Outlet store to find this gorgeous navy dress! It does have a shorter overall length so I passed on this dress in petites but I highly recommend trying it on for size. Get 50% off everything at Ann Taylor. Use code FALLFAST. Valid in stores and online. Sale ends tonight 10/10 at 3AM ET. This moto jacket fits well and the material is a substantial weight making it perfect for fall layering. It’s also available in a pretty beige color which looks like a soft pink in person. I found that it fits true to size in my usual size 0P. This ruffled sleeveless shell is the perfect layering blouse but the sizing does run about one size bigger. Size XXSP fit like size XSP. I love the deep mahogany color for fall and I believe this lacy fringe top may not be available online yet. If you love this style it’s also available as a dress. Size XXSP fits like size XSP but the sleeves are a bit short on my arms since I have longer arms than most petites (I usually prefer a 23″ sleeve length). 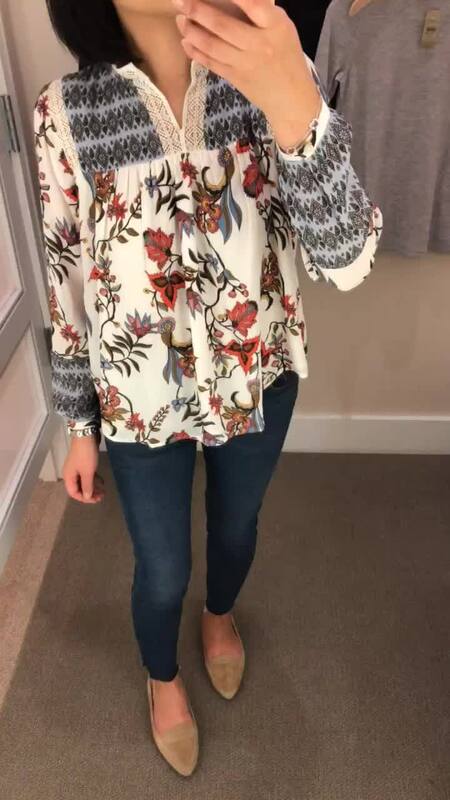 I also tried on this pretty fan floral print blouse after seeing it on an associate in store. Size XXSP fit me everywhere except for the shoulders and bust which appear to be cut more narrow so I would say this top fits true to size. I would need this blouse in my usual size XSP. It is slightly sheer despite the darker print so a layering cami is recommended. 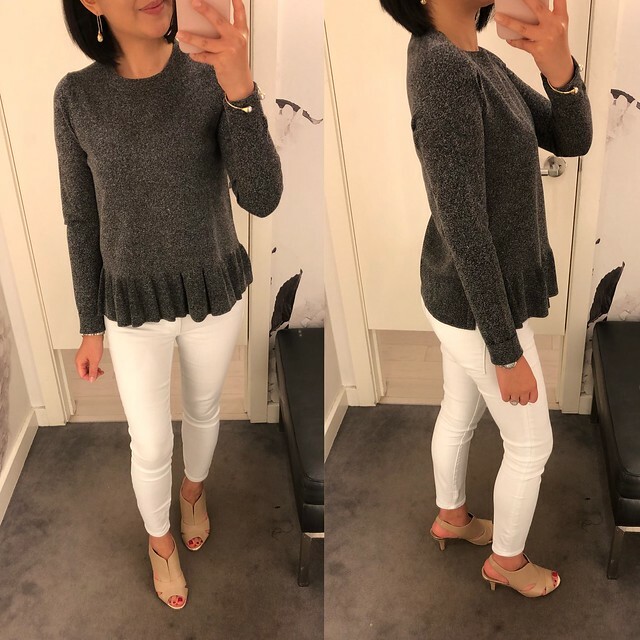 If you love a cute peplum hem then I would recommend trying this grey sweater. I liked the length and relaxed fit of size XS regular but the sleeves were a bit long so I cuffed them once. I found that this sweater fits true to size. This sale is the perfect time to pick up a classic pair of leopard print pumps. I love the lower heel height on these and I took them in my usual size 7. I purchased mine in store with my LOFT Cares card (Ann Cares cards are also available at Ann Taylor) for an extra 25% off when they were 40% off so I wish I had waited a week before purchasing them since it’s currently 50% off. These round toe block heel pumps run true to size and LOFT also has a similar style as well. 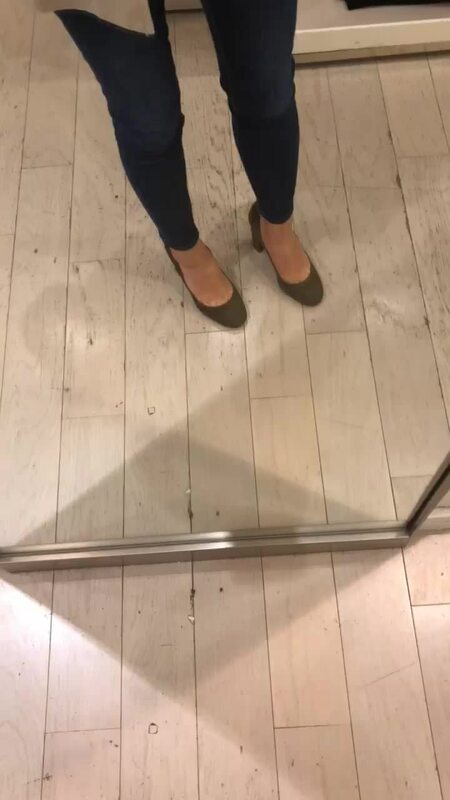 I love the olive suede for fall with jeans. Talbots – Get 25% off your full-price purchase. Discount will appear in shopping bag. If you love a good neutral shoe I recommend trying these wedge heels. I found that they run true to size to about 1/2 size large and the light acorn color is perfect year round. 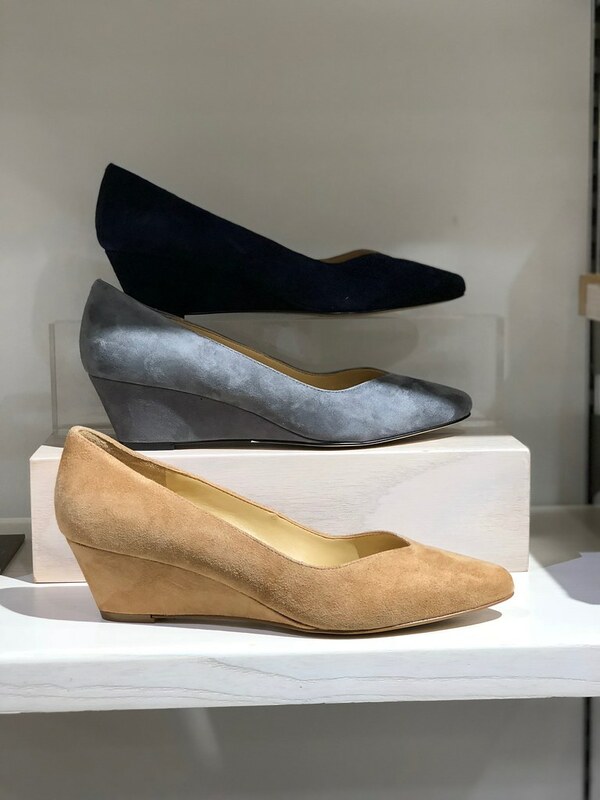 I ordered these Francesca bow-front driving flats as a store send sale (for free shipping to my home) otherwise I would have purchased these wedge heels. There are so many adorable Parisian inspired pieces in Talbot’s latest collection! I was looking for the Provence Tweed Jacket to try on since it reminds me of a Chanel tweed jacket. Unfortunately petites were not on the floor and the associate also checked the back for me but she also had no luck. I saw it in the regular missy and plus sized missy sections and the jacket is more white than ivory. I also spotted this bow sleeve dress while walking around and I had to try it on for size since it looked really long on the hanger. 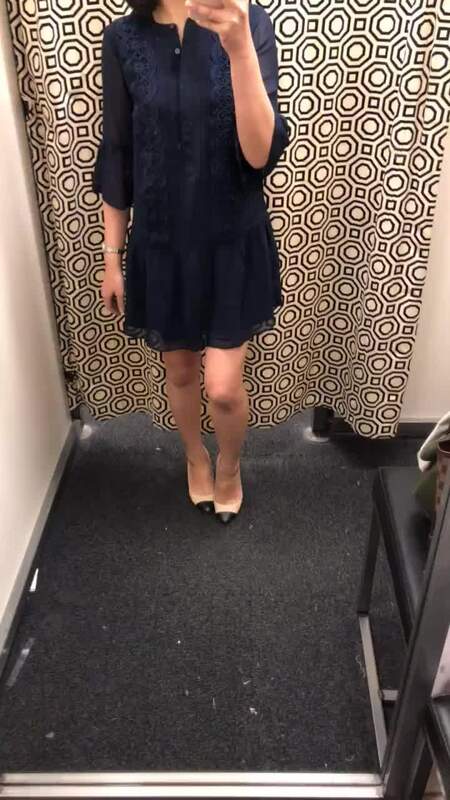 I tried on size P and I was surprised that the dress fit me well. The length is very modest and work appropriate. The grosgrain bows are sewn so they won’t fall apart and need to be retied. The material isn’t too thin but up close it looks like a faded navy wash as you can see here. I passed on this dress since I wasn’t sure that the color would hold up well over time. 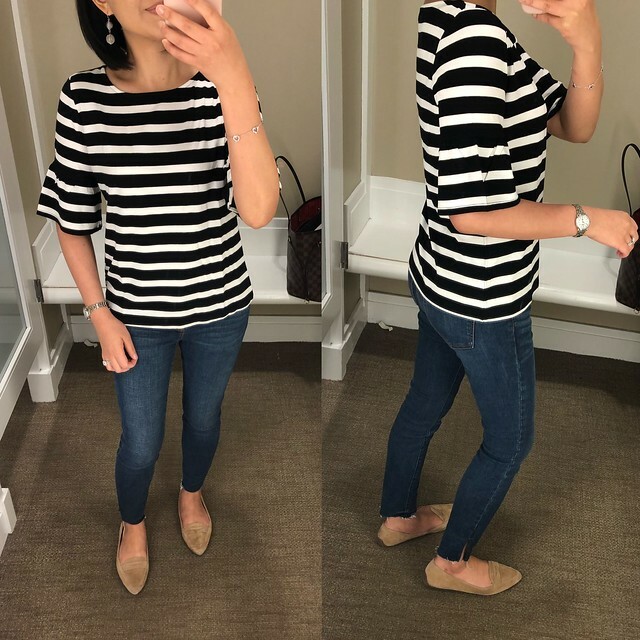 I also spotted this cute stripe tee and it looked wide/boxy on the hanger but I tried it on anyway. I’m so glad I gave it a chance because I loved the fit of size SP which fits like LOFT size XSP. Note: I purchased this top in store using this 40% off coupon which expires 10/9. I would be careful about doing a half tuck with this top because it can be prone to getting those mysterious little holes near your belly button due to the thinner fabric. 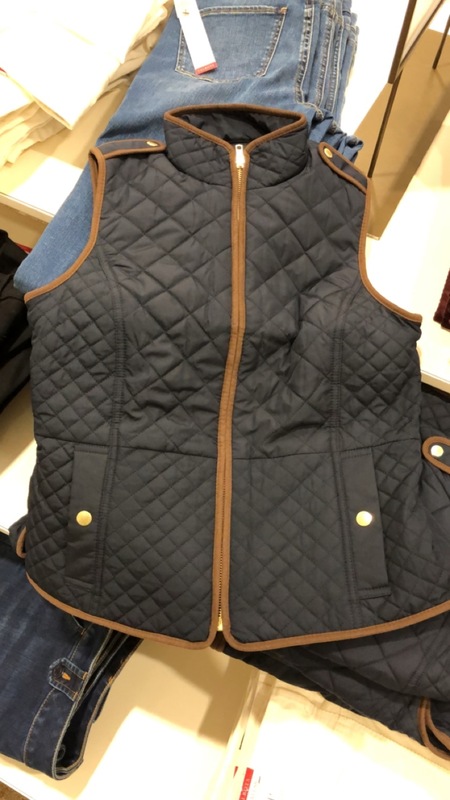 If you’re looking for a figure flattering vest this quilted barn vest is a great option and it comes in many colors and sizing options. I was already mentally at LOFT so I didn’t try it on for size at this point but I made a mental note to add this to my wish list. Lastly, this long olive vest also caught my eye on the mannequin before I headed out of the store. It was paired with an olive ruffled blouse and the monochromatic look was very chic and effortless. It’s only available in regular missy sizes and not available in petites. 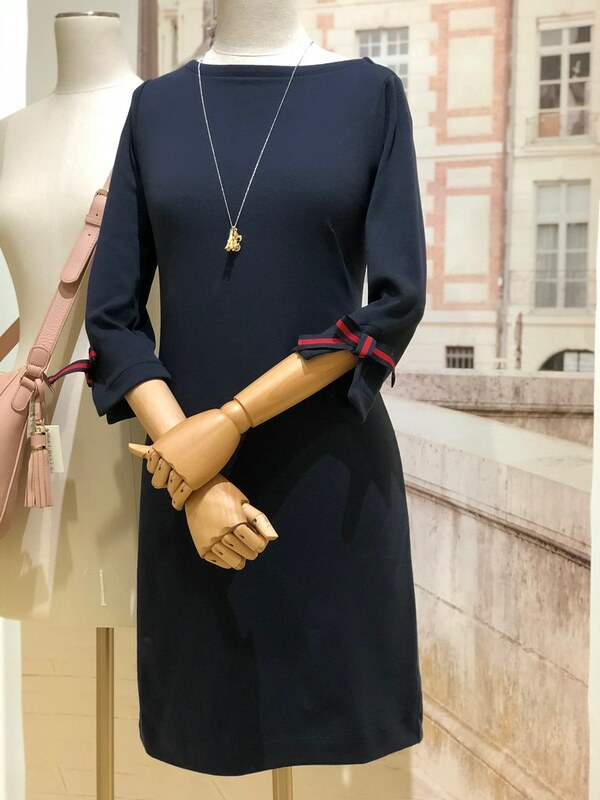 I’m not sure how I missed this post on David Jaffe @ascenadavid‘s feed but here is a preview of the Ann Taylor Winter ’17 collection. 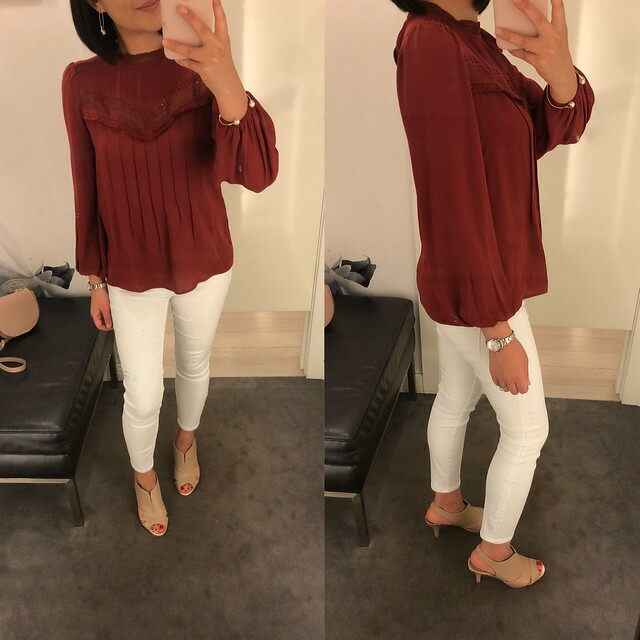 Alison @nycrecessionista also shared the LOFT Fall 17 Preview back in May where you can see a sneak preview of more gorgeous pieces to look forward to this season! If you look closely it looks like this much loved merino wool jacket (featured here and here) will back for the third year (they skipped last year)! I recently created a new page on the blog to share notable daily updates from my Instagram stories rather than bombard you with lots of short blog posts. This new page is linked on the Insta Shop page of my blog where you can shop my feed. I tried Instagram’s new polling feature but there’s still a lot of room for improvement. It would be nice to be able to export the results to Excel, close the poll before 24 hours, share the same poll to my Instagram feed and Facebook page and the list goes on! Hopefully Instagram will allow for more types of questions to choose from rather than the current dichotomous questions which is limiting. Q. Do you shop at both LOFT and Ann Taylor? This post reached 1542 people for a 26% response rate. Q. Are you team LOFT or Ann Taylor? This post reached 1520 of people for a 30% response rate. Thank you to everyone that participated last week. I value your input since this information will help me decide where to focus my time and energy!